The issue of gender equity in science has received a lot of attention recently. Governments are throwing money at it, scientists are speaking up about it and news agencies are reporting on it. Researchers interested in fictional scientists are also concerned about gender inequality in cinema and television, and its role-modelling impact on aspiring scientists. But things are changing there too. Our research into scientists and gender in Doctor Who over the past 50 years shows there are many reasons to celebrate. Doctor Who abounds with well-loved female scientist characters, such as Martha Jones, Liz Shaw, Zoe Heriot and Romana, who stayed in the show for a while and rocked the sci lab. Their scientific personae and gender politics have been discussed extensively in books and bytes. Biochemist regular Nyssa of Traken left the show using her science to help cure the galaxy’s sick. But there were also scientist characters who only appeared in a story or two. Those are the scientists we studied, looking for statistical patterns in gender representations between 1963 and 2013. After eliminating non-humanoid, robot or otherwise monstrous scientists, we counted 222. How did the genders rate on three traits signifying scientific credibility? And did these patterns change over time through Doctor Who’s original series in the 1960s, 1970s and 1980s, and new series in the 2000s? Overall, we identified many more male than female scientists; 156 compared to 56. But broken down by decade, it trends towards greater equality over time. By the 2000s, 58% were men, but the difference was no longer statistically significant. Aside from these raw numbers, we tested how the characters fared on three scientific credibility measures. 1) Did they do any scientific work on-screen? 2) Did they have authority or autonomy within their workplace? 3) And were they addressed with scientific titles, such as professor or doctor? We found lots of variation on these things, but mostly gender didn’t come into it. Overall, 75% of scientist characters of both genders performed scientific work on-screen. 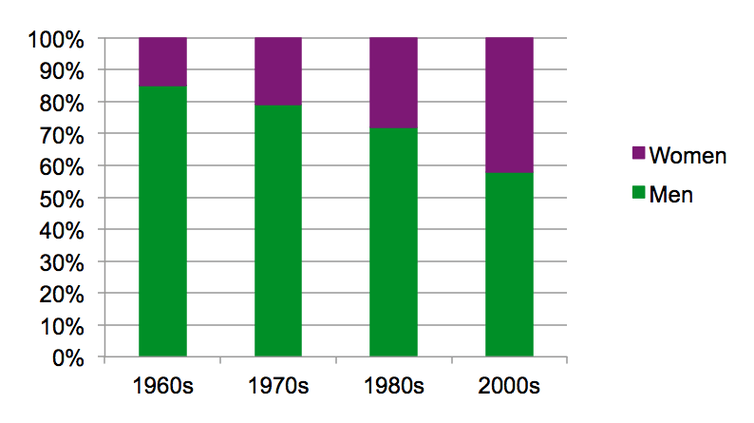 Surprisingly, a greater proportion of women than men “did science” in every decade, except the 1980s. In the 1960s, for instance, 100% of women showed us science in action, compared to 71% of men. Some, such as Anne Travers from the 1968 story The Web of Fear, showed 1960s girls and boys that science was theirs if they wanted it. Travers on how she became a scientist. The pendulum swung back in the 1980s, with only 42% of women doing science, compared to 74% of men. But happily things more or less re-equalised in the 2000s. The autonomy/authority trait came closest to a significant gender difference, with 71% of women and 83% of men holding positions of authority within the lab, or working autonomously. The 1970s let the side down on this one, with lots of authoritative men (80%) and fewer authoritative women (53%). But that decade still produced exceptions such as Professor Emilia Rumford from The Stones of Blood, an archaeologist with polymath knowledge of relativity theory. In the 2000s, women (75%) were still less likely to carry authority than men (86%), following the general trend. Rumford was among the 25% of Doctor Who women to be called “professor” or similar throughout the show’s history. This compares to 30% of men, suggesting little gender difference on this measure. The 1980s did the most heavy lifting here, with 42% of women but only 13% of men addressed by a scientific title. We read this as a conscious effort by Doctor Who’s creators to redress imbalances in previous decades. This effort is exemplified by female scientist pair Professor Rachel Jensen and Allison Williams in Remembrance of the Daleks, who talked a lot about being physicists. Though, unfortunately, they didn’t do any physics. Jensen and Williams carry a television for science. Fast forward to today, and women are now comparable on nearly every trait, are shown in almost equal numbers, and regularly play the leading role in the show’s science. For example, there are characters such as Nasreen Chaudhry, a geoscience engineer who runs a deep crust mining operation, Dee Dee Blasco, a student astronomer whose logic saves tourists stranded on a hostile planet, or Kate Stewart and Osgood, who scienced the show to its 15th anniversary. These scientists are diverse in experience, ethnicity and nerdiness, but share the common trait of strong science. Mining engineer Chaudhry from 2010’s The Hungry Earth. While Doctor Who has its ups and downs, it has increasingly striven for gender balance among scientists. Only rarely has it treated female scientists differently from male scientists, at least on average. Statistics aside, our work also shows Doctor Who links scientific incapacity to effeminate men and to societies marked by feminised social traits such as collectivity or pacifism. In this sense, the show still associates science with masculinity. But the overarching message is that anyone can be a scientist, and these days that about half of scientists are women. And that’s a message worth celebrating throughout time. Visit the Elsevier Store to access content on women in science and more! Use discount code STC215 at checkout and save up to 30% on your very own copy! Success Strategies From Women in STEM, 2nd Edition is a comprehensive and accessible manual containing career advice, mentoring support, and professional development strategies for female scientists in the STEM fields.